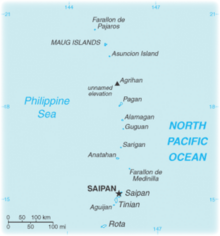 Additional Info: Consists of two groups, a northern group of ten volcanic main islands, of which only four (Agrihan, Anatahan, Alamagan and Pagan) are inhabited; and a southern group of five coralline limestone islands (Rota, Guam, Aguijan, Tinian and Saipan), all inhabited save Aguijan. The Mariana Islands are an archipelago made up by the summits of 15 volcanic mountains in the north-western Pacific Ocean. They are the southern part of a submerged mountain range that extends 1,565 miles from Guam to near Japan. Geographically, the Marianas are the northernmost islands of a larger island group called Micronesia. The Northern Mariana Islands (including the islands of Saipan, Tinian and Rota) make up a Commonwealth of the United States. Once the site of a historic WWII invasion, Saipan is best known for its WWII artifacts, including sunken tanks, planes and ships. It is also home of the world famous Blue Grotto. The western side of the island of Saipan is lined with sandy beaches and an offshore coral reef which creates a large lagoon. Tanapag Harbor - A major wreck diving area, an estimated 18 Japanese ships were sunk and many remain undiscovered. Diving depths in Tanapag Harbor range from 17 to 35 ft. The sea floor of this harbor is littered with WWII wrecks - a Japanese Seaplane, Multiengine Bomber, Sub Chaser, Zero Fighter and Landing Craft. One of the most interesting wrecks is the Shoan Maru, a 407ft long WWII Japanese freighter torpedoed in 1944. The other big wreck in the area is the Cement Wreck - a 350ft long concrete supply barge that lies in 20ft of water with parts of the deck awash. Underwater visibility in the harbor area is generally 70 ft.
Blue Grotto - Saipan's most unusual dive experience and truly an extraordinary natural formation. Drive, then hike down 103 stone steps carved into the rock formation bringing you to the breathtaking underground cavern with a high, domed ceiling. The bottom part of the cavern is a luminescent blue pool of seawater - lit by sunlight streaming through two underwater tunnels. The pool, roughly 100 ft in diameter, slopes down to a depth of 60 ft. Tunnels lead from the pool to the open ocean, where they exit onto the face of a vertical wall. Underwater visibility is generally 150 ft. The outside vertical wall has an interesting array of sea fans and marine life, including schooling jacks and whitetip sharks. Tinian Another of the three principal islands of the Commonwealth of the Northern Marianas Islands, best known for being the base from which the American atomic bomb attacks on Japan during World War II were launched. Tinian's largest village is San Jose. The northwest side of the island appears to have been a giant dumping ground for WWII equipment, which was pushed off the cliff. 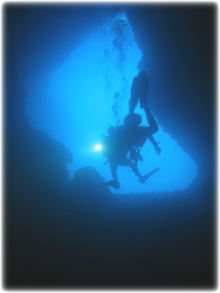 Average diving depth is 35 ft, and underwater visibility is crystal clear - exceeding 100ft. Among the artifacts that litter the bottom are Japanese tanks with treads still in place, trucks with rubber tires intact, bullets and shell casings of all sizes. Swimming along this debris are many exotic tropical species including Lionfish and Moorish Idols. Carolinas Point on the west side offers a vertical drop off with quite a bit of shark action. There is more current, but also a great deal more fish and marine life. Rota Rota, also known as the "peaceful island", is the southernmost island of the Northern Mariana Islands and the second southernmost of the Marianas Archipelago. Songsong village is the largest and most populated followed by Sinapalo village. Rota is the tip of a submerged mountain, rising more than 36,000 ft from the floor of the Marianas Trench, the deepest waters in the world. Visibility is around 200 ft. A beautiful island with mountains, jungle, spacious parks and beaches, it offers the clearest water in Micronesia, along with two world class dive sites - Shoun Maru and Senhamon Cave. Shoun Maru (note, different spelling to the Shoan Maru on Saipan) was a Japanese freighter, which now rests upright in the sand at a depth of 110ft. From the surface you can almost see its entire 393ft length. For underwater photographers, it is a dream come true! With most shipwrecks being found in waters of limited visibility, one of the most difficult things to depict is the total look and feel of the vessel. On this one, you can drop back and shoot the broad vistas, depicting its massive size and bulk-diving the way it ought to be. Senhamon Cave - An underwater grotto, with a dramatic archway entrance at a depth of 40 ft, and an inner chamber illuminated by an overhead skylight. The excellent visibility allows photographers to shoot dramatic silhouettes when the sun is streaming through the skylight. Whitetip sharks are frequently encountered as they swim through the cavern. Grouper, squirrelfish, and bronze sweepers are common, as are lobster hiding in the crevices. A side exit is decorated with delicate sponges and lace corals, along with a spectacular flame scallop that sports a vivid electric bolt pattern outlining its lips. The reef in front of the cave is a breeding ground for horse conch - hundreds lie scattered throughout the area. A tunnel, or alleyway system, runs throughout the reef, housing lobster, morays, and whitetip sharks. Pelagic visitors spotted include tuna and marlin. USS Saratoga - A US aircraft carrier (the only diveable craft of this kind) lies upright in 180ft of water. The superstructure is at 70 ft, deck at 100 ft and the airplane hangers at 130 ft. The USS Saratoga is a steel-hulled vessel with a waterline length of 830 ftt and a flight deck of 888 ftt officially weighing 33,000 standard tons. HIJMS Nagato - Considered the flagship of the Imperial Japanese Navy. The ship is inverted, lying in 160-170 ft of water. The steel hulled vessel is 708 ft long and weighed 38,500 standard tons. USS Arkansas - A US battleship lies inverted in 180 ft of water. The riveted steel vessel is 562 ft long and weighed 23,066 standard tons. USS Pilotfish & USS Apogon - Both US navy submarines 311 ft long and weigh 2,424 standard tons submerged.